Posted February 25, 2015 by finnfemme & filed under Beauty, Fashion, Vintage. Yardley of London always seemed to be spot-on with trends in the late ’60s and into the early ’70s. Their late ’60s advertising tended to be either London Mod or Ethereal Romantic, and featured gorgeous ‘Yardley Girl’ models Jean Shrimpton, Olivia Hussey, and Patsy Sullivan. 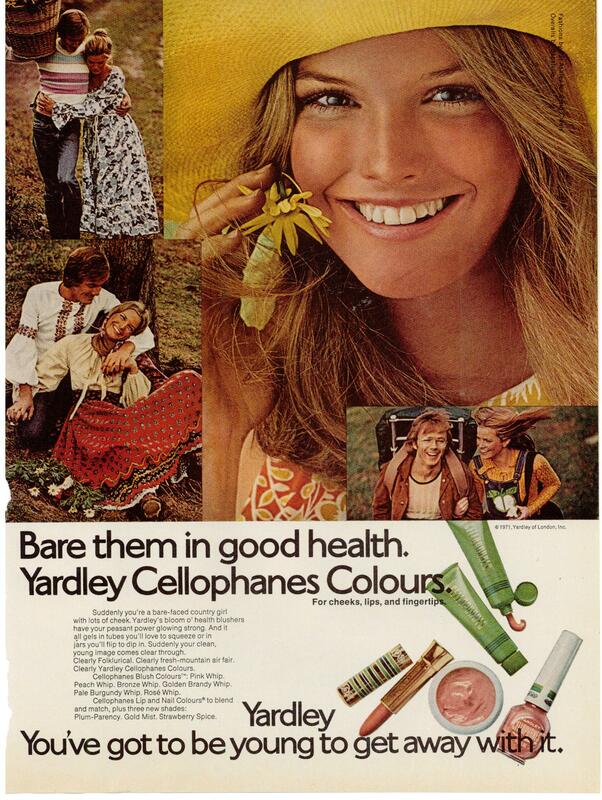 By the early ’70s, Yardley took on a more Folklorical (their term) marketing campaign. 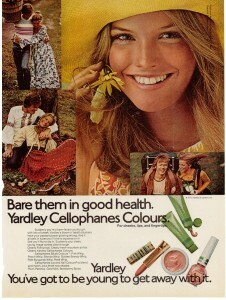 This ad from 1971 for Cellophanes Colours features more of a fresh-faced outdoors country look. Models are in flowing peasant dresses, ethnic tops, and hippie jeans and overalls. 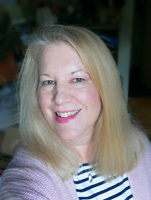 The makeup colors are earth-toned and bare. The back-to-nature bohemian ’70s had begun!